Fig. 1 Schematic representation of (A) the BCR and ABL genes demonstrating the primary breakpoint cluster regions (bcr) and (B) the RNA/cDNA structure of the most common chimeric transcripts and the primers used for their RT-PCR amplification. The m-bcr occurs in the uncommon chronic neutrophilic leukemia and is not routinely evaluated. (C) Conventional qualitative RT-PCR for detection of the most common BCR-ABL fusion transcripts using gel electrophoresis. 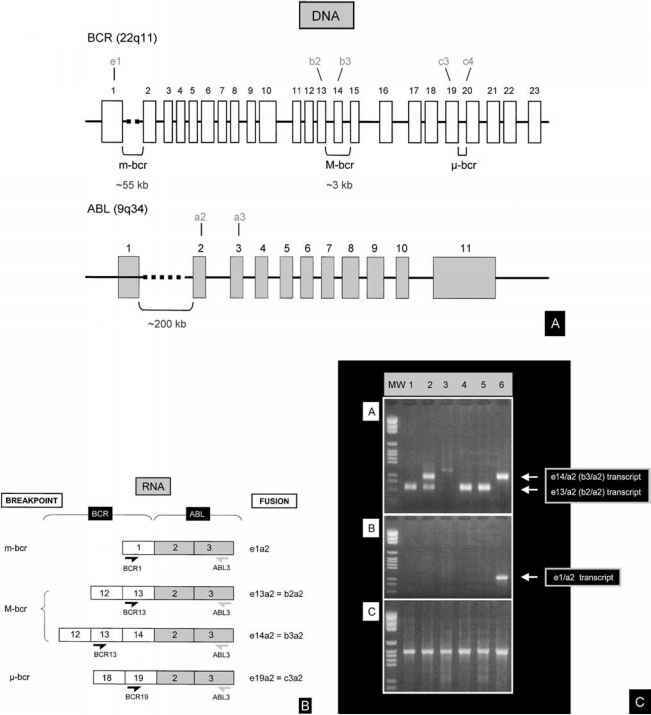 Upper panel (A): BCR exon 13 (b2) and ABL exon 2 (a2) primers. Middle panel (B): BCR exon 1 (e1) and ABL exon 2 (a2) primers. 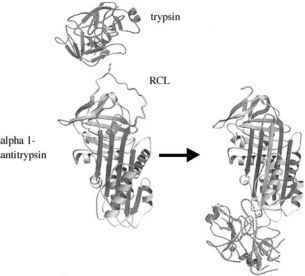 Lower panel (C): b2-microglobulin primers. Lanes: (1) intron 13 breakpoint, (2) intron 14 breakpoint with alternative splicing to BCR exon 13, (3) ? novel breakpoint, ? nonspecific band, (4) intron 13 breakpoint, (5) intron 13 breakpoint, (6) intron 14 breakpoint with alternative splicing to BCR exon 1. See text for details. approaches are to be avoided for routine laboratory practice given the significant risk of contamination and false positivity. With nonnested, simplex RT-PCR, one assay is performed using a single pair of primers. Primers for BCR exon 13 (b2) and ABL exon 2 (a2) identify both the e13a2 (b2a2) and e14a2 (b3a2) fusion transcripts that differ in size by 75 bp (Fig. 1C, lanes 1 and 6, upper panel). Use of this primer set allows for the molecular detection of CML in nearly all cases 99%); however, in rare instances, variant breakpoints may occur, yielding a false-negative result or alternatively sized RT-PCR product. The incorporation of an ABL exon 3 (a3) primer, in place of an a2 primer, permits the routine detection of rare ABL intron 3 breakpoints and has been recommended by some for routine evaluation. Multiple fusion transcripts may be detectable with a single BCR intron 14 breakpoint due to alternative splicing of the primary transcript that yields either an accompanying e13a2 (Fig. 1C, lane 2, upper panel) or an e1a2 (Fig. 1C, lane 6, upper and mid panels) transcript. Identification of the e1a2 transcript requires a separate BCR primer targeting BCR exon 1 (e1) (Fig. 1C, mid-panel, lane 6), and although not essential to the diagnosis of CML, some studies suggest its presence to be a poor prognosticator associated with metamor-phosis.